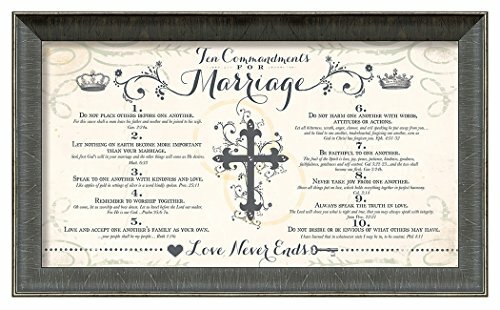 Carpentree 10 Commandments Marriage Artwork, 21 x 13"
Carpentree 21"x13" 10 Commandments Marriage Artwork. Find your inspiration at Carpentree. Since 1976, Carpentree has created and produced American made decor and gifts to bless and inspire your daily lives. At Carpentree, our mission is to create, produce, and distribute products that glorify God and bring inspiration to people in all walks of life. Artwork says "Ten Commandments for Marriage ... 1. Do not place others before one another. For this cause shall a man leave his father and mother and be joined to his wife Gen 2:24a. 2. Let nothing on earth become more important than your marriage. Seek first God's will in your marriage and the other things will come as He desires. Matt 6:33. 3. Speak to one another with kindness and love. Like apples of gold in settings of silver is a word kindly spoken. Prov 25:11. 4. Remember to worship together. Oh come, let us worship and bow down. Let us kneel before the Lord our maker. For He is our God...Psalm 95:6-7a. 5. Love and accept one another's family as your own. ...your people shall be my people... Ruth 1:16c. 6. Do not harm one another with words, attitudes or actions. Let all bitterness, wrath, anger, clamor, and evil speaking be put away from you...and be kind to one another, tenderhearted, forgiving one another even as God in Christ has forgiven you. Eph 4:31-32. 7. Be faithful to one another. The fruit of the Spirit is love, joy, peace, patience, kindness, goodness, faithfulness, gentleness and self control. Gal 5:22-23...and the two shall become one flesh Gen2:24B. 8. Never take joy from one another. Above all things put on love, which holds everything together in perfect harmony. Col 3:14. 9. Always speak the truth in love. The Lord wills how you what is right and true, that you may always speak with integrity. from Prov 22:21. 10. Do not desire or be envious of what others may have. I have learned that in whatsoever state I may be in, to be content. Phil 4:11. Love never ends." DecorArts -The Last Supper, Leonardo da Vinci Classic Art Reproductions. Giclee Canvas Prints Wall Art for Home Decor 32x18x1.5"